Knowing where mobile assets are at all times increases peace of mind. With a superior motion sensing accelerometer, administrators always know where equipment is. Run reports and receive near real-time updates daily, alerting system administrators of the statuses of mobile assets. Examining near real-time data can help reduce theft. 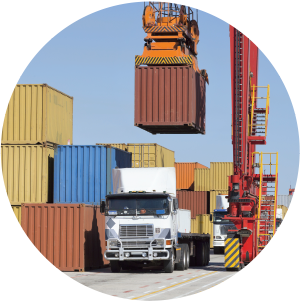 Features like fast track enable device tracking as often as every five minutes when active, or once daily when dormant. For businesses, the unknown is dangerous, especially when it comes to assets. Business owners should always have clarity and understanding when it comes to the tools that power their operations. AT&T Workforce Manager for Mobile Assets protects your business by allowing you to monitor the locations and statuses of your high-value assets. 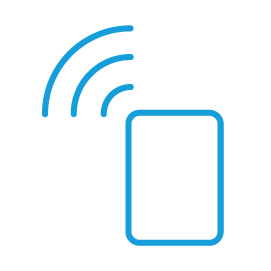 Maintain visibility of current locations of high-value mobile assets. 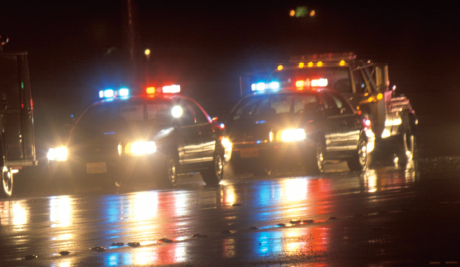 Retrieve stolen property quicker and with a higher success rate. React quickly after being notified when an asset’s status changes. With AT&T Workforce Manager for Mobile Assets, track and retrieve your lost equipment faster and with a higher recovery success rate. 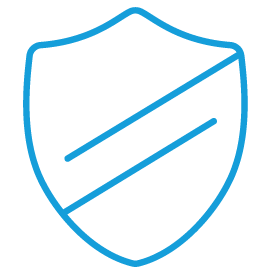 Oversee all out-of-office jobs involving your mobile assets, providing the ultimate level of security and asset management. Track assets from any web browser. Keep tabs on assets to make sure they aren’t forgotten at job sites and if they are, recover them quickly. 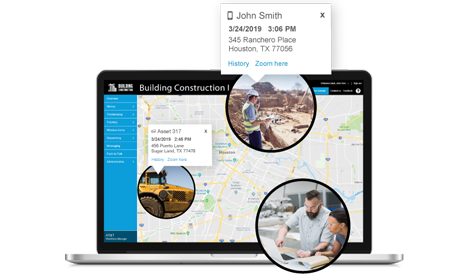 AT&T Workforce Manager for Mobile Assets implements intuitive and user-friendly technology aimed at curbing losses and increasing your peace of mind. View that information from any desktop web browser and maintain a constant state of awareness regarding your equipment. Have complete visibility to current locations of high-value assets from cellphone, tablet or vehicle mounted devices. Receive real-time updates daily, alerting system administrations of whenever assets move, doors are opened, or any other instance you dictate. Alerts display when assets are moving or leave a designated area. Alerts notify administrators of whenever an asset isn’t where it should be or is operating out of routine business hours. Take the proper course of action when you learn that an asset’s status or location has changed with the information alerts provide. 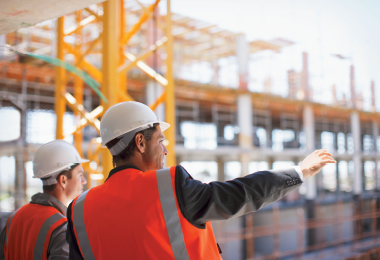 Ensure your assets aren’t opened or operated after approved hours. 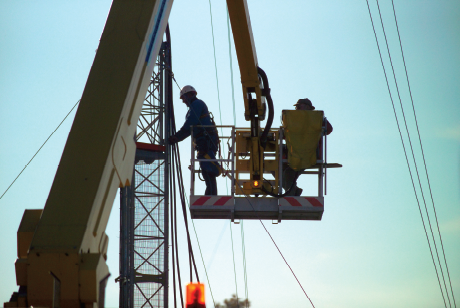 Monitor asset locations to make sure high value equipment isn’t left at job sites. Tamper alerts - Know if assets are operated when they shouldn’t be. Battery dead alerts - Monitor battery life to ensure assets are functional when you need them. Unauthorized movement alerts - Ensure assets are always at the correct locat. Receive near real-time updates that alert system administrators of whenever your assets move in any way. Complete visibility to current locations of critical mobile assets from cellphone, tablet or vehicle mounted devices. Receive near real-time updates daily, alerting system administrations of whenever mobile assets move, or any other instance you dictate. Fast track mode enables when assets move. 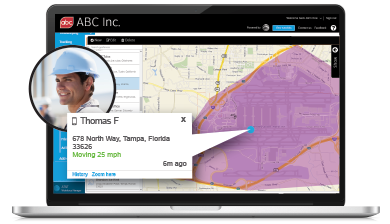 Tracking automatically speeds up to provide asset locations every 5 minutes. When fast track is dormant, devices track only once daily to save battery life. 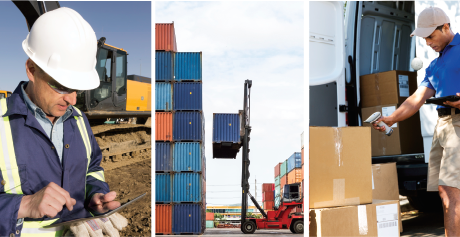 Asset mounted devices provide the whereabouts and statuses of your equipment. When fast track enables for a device, a command is queued and on the scheduled position, the device will enter a “fast track state” allowing you to define how often you want to receive position updates. When the fast track option is dormant, devices track once per day (with options to track at 60, 30, 15, or 5-minute intervals) when movement is detected. Geofences are virtual boundaries that can be set around high-priority assets in order to monitor whether they move from specified locations. When an asset enters or exits a marked location, alerts can trigger to keep system administrators aware. Notify administrators of asset arrivals and departures from specified locations. Geofences can take the shape of either a circle or a polygon. Up to thirty defined points of interest can be encompassed with geofences. Geofences are virtual boundaries that you can monitor asset locations and prevent theft. They help ensure your assets remain at, or avoid the places you deem important. Keep your administrators aware of your assets as they arrive at and depart from key locations. Geofences can take various shapes (circle or a polygon) to cover a wide range of locations. Up to thirty defined points of interest can be encompassed, so you can remain confident that your assets avoid troublesome areas altogether. Ad hoc reports are created using data accumulated by CalAmp tracking devices and into the workforce manager application by users. Create your report right from the application, and eliminate the additional step of exporting data to another application. 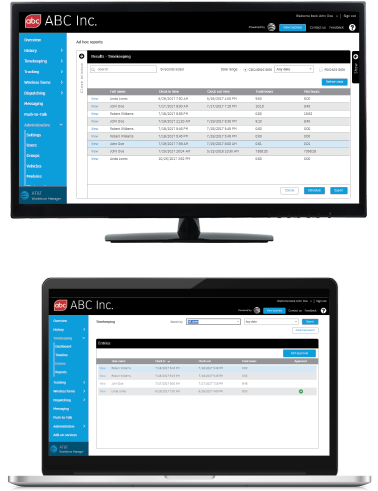 Ad hoc reports allows you to create a report tailored to the specific data you want, based on the available data. With the Manager App view, you can see the positions of your employees while away from the office. 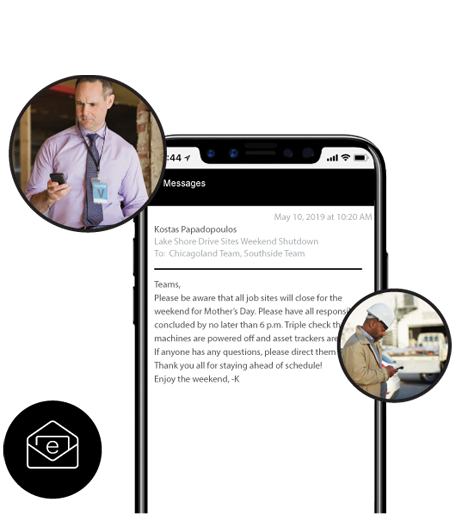 This style of view is accessed through AT&T Workforce Manager’s mobile app for smartphones and tablets, and is designed to bring even more versatility to your daily operations. Monitor your mobile staff’s near real-time locations without having to use a desktop computer.  Effectively manage your workforce while on the go. 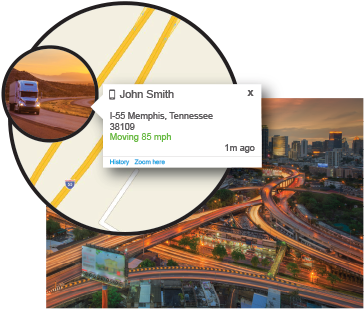 Your developers can integrate important locational and route history data with third-party systems using GPS APIs. Consolidate your company’s valuable information. Easily mesh valuable GPS information with weather mapping systems or GIS software. 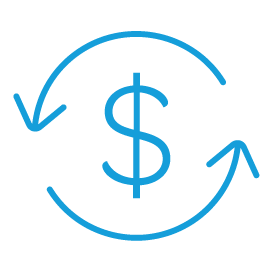 Save time and money by streamlining processes. Set custom timeframes for your employees to be tracked, and monitor them only while they’re on the clock. 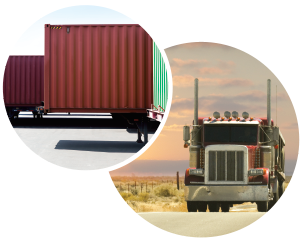 GPS tracking schedules allow you to protect employee privacy, and respect union concerns outside of working hours. See near real-time traffic patterns on your solution’s live view map, and make better decisions about which routes mobile employees should take to job sites. Stay up-to-date with roadway congestion in near real-time. Increase efficiency through smarter route planning. Optimize travel for reduced wear-and-tear on your business vehicles. 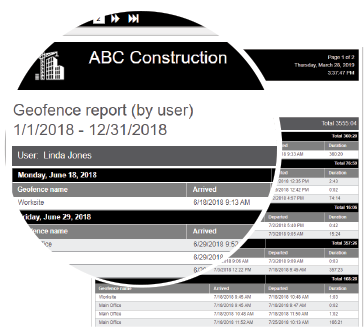 Instantly locate the last location of assets in live view, review location history/breadcrumb trails in user history and review the amount of time spent on locations with landmark reports with the CalAmp ATU-620. Daily location updates when assets are stationary. Position updates with available movement and stop alerts. Updates as frequent as every five minutes when assets are in motion. Receive position updates 1, 2, 3, or 4 times daily. Send up to 900 tracking positions on fully charged AA batteries. *Tracking metrics are estimated based on fully charged Energizer Lithium batteries and optimal conditions. Actual results may vary. Rugged exterior designed to withstand tough outdoor conditions. 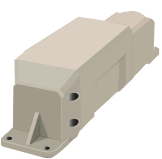 Built-in 3-axis accelerometer for motion sensing. Built-in cellular and GPS antennae for easy installation. 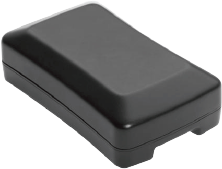 6-month rechargeable battery built to track multi-year deployments or assets that sit idle for extended periods of time. 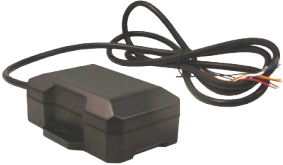 Two input and output modules which allow you to monitor power sources. Daily alerts notify administrators that the device is still active and tracking. Low battery indicator keeps you aware of power levels. Fast track option available (Ping options are every 60, 30, 15 seconds or once every 5 minutes). 57 Ah Lithium field replaceable batter pack.